Potential bloggers have frequently asked the RCEMLearning team for a template or some kind of formal guidance about how to write blogs. It’s a really tricky juggling act because blogs aren’t as standardised as content types on the site that warrant templates (such as Cases, SAQs, and Learning Sessions, the templates for which you can find here). We do of course signpost to popular blogs on the site as exemplars – which include I’m not burnt out, I’m just tired, Down Syndrome for the Emergency Physician, and Silver Trauma – but that’s often not enough; contributors want something a bit more tangible. It’s also a bit grandiose to dispense advice that asks for blogs to be ‘chatty but informed, evidence-based but aligned with house style.’ What do those phrases mean? Can good blogging for EM or any other discipline pull-off that juggling act? How can you deliver interactivity and shareability when your audience expects robust and credible evidence? Are the two mutually exclusive? The popularity of blogging reflects the enduring primacy of the written word, and our fundamental need for learning to have strong narrative foundations. If you’ve yet to do so have a look at this wonderful blog from Simon Carley about the power of narrative learning But good blogs usually employ a range of multi-modal content (pictures, videos, infographics etc.) to support their points. How do you do this without undermining your core narrative? The remainder of the blog will be divided into a series of subsections. The first two concern themselves with some of the more abstract rhetorical concepts about the reasons why blogs work, and how potential authors should approach them. The closing three sections are concerned with the more practical elements associated with blogging, including pre-writing strategies, supporting media, and a checklist to review ahead of submission. 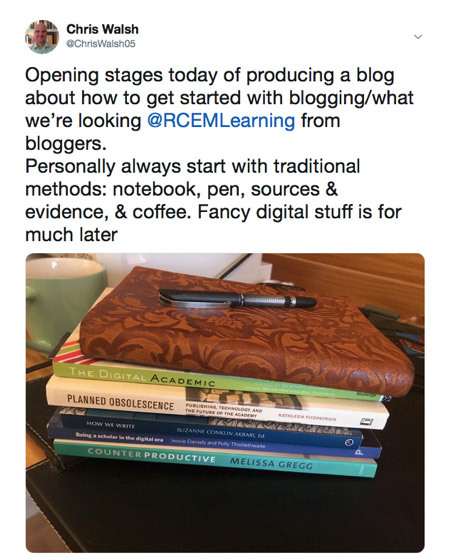 My hope for this blog is that you finish it with greater clarity about two things; a reconsideration of how best to conceive of and engage with your audience, and a clearer idea of what to do if you’re up for submitting a blog to RCEMLearning. In Being a Scholar in a Digital Age Jessie Daniels and Polly Thistlewaite argue that immersion in digital practices such as blogging enable educationalists to ‘be recognised as an expert in a particular area, to build relationships, to engage with others to conceptualize and develop ideas, and to have an impact beyond a small circle of other experts’1 (p.94). This a succinct yet comprehensive summary of the reasons why people blog, but it’s worth unpacking a bit. Blogging is a way to establish and maintain an educational persona, and it has altruistic and selfish aspects: of course it benefits the greater good by helping to embed and disseminate knowledge, but it can also help to boost individual reputations and educational capital in increasingly competitive environments. It doesn’t replace conventional research (although it can help some of those traditionally secreted processes associated with academic activity become more transparent, as evidenced by the recent TERN blogs on RCEMLearning), but it’s an adjunct to it. There’s also some sound pedagogical reasons which help explain the continued impact of the written word mediated via blogging. Neil Selwyn is one of the most critically persuasive writers on educational technology, and he acknowledges that education has ‘long been considered a conversational, communal, and collaborative process. Digital technologies are seen to be the ideal spaces for such conversations and collaborations to take place’2 (p. 33). One of the many pedagogical strengths of blogging is that it can provoke internalised dialogues within individual readers – it can crystalize thoughts, it gets you to re-consider approaches, it introduces you to new evidence, and potentially even suggests new ways of presenting that evidence. But consider what can be ‘done’ to a blog that also constitutes discursive activity; It can be shared, printed, pinned, Tweeted, posted (online or offline). When done well blogging is predicated on discursive and narrative learning in a form that affords interactivity and multi-modality which aligns with different individual and organisational learning environments. Before moving on to some of the more practical elements it’s worth reminding ourselves of a fundamental but frequently overlooked issue: a writer’s relationship with their audience. Digital writing has dramatically changed conceptions of audience; it can still be a private one-to-one deal between author and reader, but the inherently discursive nature affords easy sharing on social media, use in teaching in a variety of contexts, and perhaps even engagement from patients. There will of course be people that will never be convinced by the persuasiveness and efficacy of blogging. Indeed, they may be the same people who decry everything digital, who maintain it does nothing but corrode attention and criticality. I find this simplistic view as tired as the digital native vs. digital immigrant debate. Cathy Davidson’s The New Education reports on an extensive review of undergraduate writing conducted at Stanford University which revealed that contemporary students were ‘unusually adept at Kairos, a rhetorical term meaning the ability to assess your audience and shape your style, tone, language, and technique for that audience’3(Davidson, 92). The relationship with your audience is a central and reciprocal one – giving appropriate attention to how best engage, persuade, convince and get your audience onside is crucial. Many great blogs come out of what Kathleen Fitzpatrick refers to as ‘small, persistent question[s]’4(Fitzpatrick, 71). A question or issue that you keep coming back to is a great place to engage with as it’s more than likely something that warrants further attention. Topics can also be identified by fleeting encounters in literature, social media, or personal experience (my Tweet below captures the first stages in generating evidence for this blog, and it’s an example of the kind of supporting materials and evidence gathering resources you can use). These fleeting encounters can be the springboard you need to develop an idea. Way before the formal process of drafting takes place ideas are discussed and kicked-around on different online environments. The RCEMLearning team are big fans of Slack and Trello, which afford digitally mediated conversations. Of course it’s hard to find the time, but reading across disciplines is key. There’s a number of blogs about how to blog for academic audiences, including the LSE series and Pat Thomson’s wonderful blog about academic writing. The evidence-gathering phase can be a time-intensive one. To offset this I always practice active reading of print or digital texts. 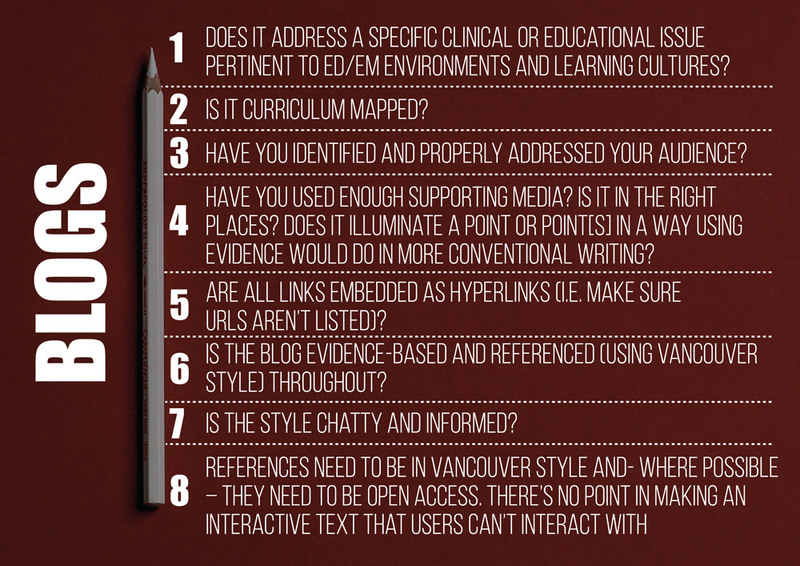 This involves highlighting, annotating, notetaking, mapping extracts of texts – and your responses to them – in some kind of rough order. I still conduct this offline, as it helps me identify patterns and refine my focus. I then do a bit of free writing to tease and narrow down ideas. This allows me to come up with a more formal abstract with subsections to be developed – I then go back to my notes, evidence and supporting media to figure out what needs to go where. The fancy term here is multi-modality, and it’s crucial as it’s what ultimately differentiates blogs from other text-centric offerings. Blogs are a malleable form that can be structured in a way that allows you to target your audience and use the most appropriate evidence to engage with them. So hyperlink to other blogs and supporting evidence (use open access sources where possible), embed videos, use infographics, use illustrations or cartoons, and so on. Even breaking up the text so paragraphs alternate with bullet points can be an effective way to vary your text to maintain engagement with your audience. 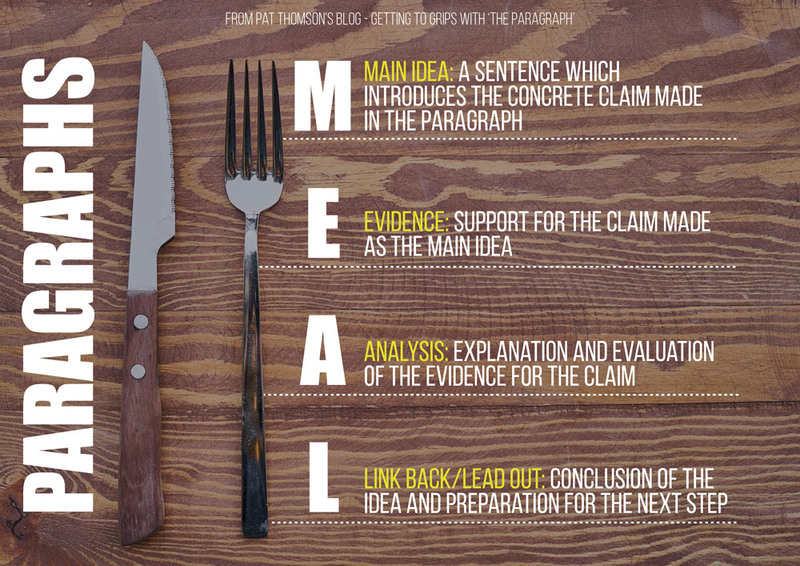 It’s analogous to where and how you’d use evidence in an academic paper or a journal article; where a claim needs to be underpinned with supporting evidence then bring some in. The difference in blogs is the evidence you can use is more varied and interactive. Now you’ve decided what to write about, we wanted to give you some tips on how to send them to us! We aim for our blogs to be fun, interesting, and relevant to UK Emergency Medicine. We don’t want them too long – about 800 words, and they should be evidence based with excellent supportive media. They should be as informative as a standard textbook, but more fun to read. – Once the blogs team have confirmed this subject is not in progress, start writing. Email the blog and curriculum codes to the blog team as a word document. Put in any website links as text with the website address in brackets. Don’t worry about the formatting – it gets reformatted as we put it on the website. If you use any pictures, email them separately. Tell us which website you got them from. Any pictures need to be creative commons- do a google image search, click “more”, click “labelled for non commercial use with modification”. Create some infographics. Canva is a great tool for this. Daniels, J and Thistlewaite, P. Being a scholar in the digital age. Bristol: Policy Press: 2016. Fitzpatrick, K. Planned obsolescence: Publishing, technology, and the future of the academy. New York: New York University Press: 2011.